Empire Deluxe Combined Edition is the latest in the classic Empire Series of games, which has spanned almost five decades. Empire Deluxe is a game about taking cities. Starting with just one, the city enables a commander to produce units. These units in turn can directly attack or support the attack of more cities. Positive (23) - 82% of the 23 user reviews for this game are positive. At some point in your life you recognize that you are Made. For Sarge, that moment has finally been obtained with the introduction of the Empire Deluxe T-Shirt series, produced by The Mandala Girl. These shirts can be reviewed on the The Mandala Girl website, and ordered through Amazon. The Mandala Girl involves player and a member of our Empire Community. They were wanting to express a love for the greatest computer wargame ever and to take it to the next level. With only 5 million printed, supplies are limited so order soon, as the time has come for you to show us your true nerdiness by wearing one to a party! With the New Year time here, my expertly crafted and designed marketing tool, Santa Sarge, makes another appearance. Now an almost 20 year tradition, you can feel the subliminal urges that he casts upon you to play Empire Deluxe. Though he is definitely late this year due to a 'real life' event, he is always happy to show his mug. We have now logged an entire year since the release of the Combined Edition. The great news is EDCE is included in Das Tactic's strategy games list for this year. I always enjoy Das as he is not a carefully crafted marketing tool, but actually plays games he likes in a very detailed way. His list has many titles, and there are a few in it that I do not have that I am going to look over. So wishing you a happy and healthy 2019! Empire Deluxe is a game about taking cities. Starting with just one, the city enables a commander to produce units. These units in turn can directly attack or support the attack of more cities. Your imperialistic desires are not satisfied until you have taken every city on the map. There can be multiple opponents with the same goal. You cannot work with them to capture all of the cities. They don't want to work with you. You must work against them. You spend a good amount of time preventing them from taking your cities, and you try your best to capture their cities. So come back to the classic 4x strategy wargame that has inspired so many other games! 4 Built-In Unit Sets, each a progression from the previous: Basic, Standard, Advanced and Enhanced. Anywhere from 6 to 30 unit types, some including land, naval, air, submarine, artillery, engineers, satellites, missiles unit types. Optional additional rules and victory conditions. Play Solitaire or Against Humans in Hot Seat, Email and Network Play. Built-In Unit Set Modification Editor allows you to make adjustment to the unit sets. AI player source code available online to make your own AI players. World Building C# source code available online to make your own map makers. Hours of Fun, for many even as much as hundreds or thousands! And a game you may still be playing in 2045 on Mars. (Interplanetary play not yet implemented). 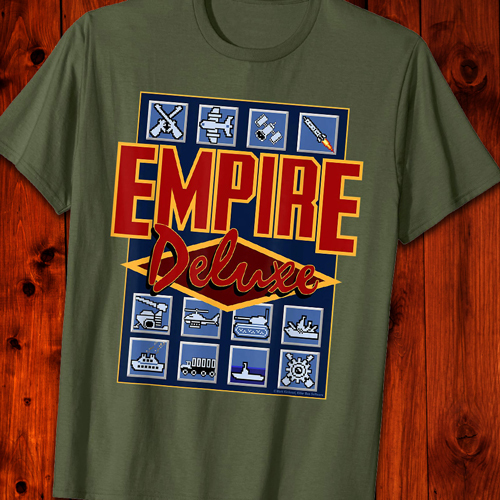 Empire Deluxe is a Trademark of Mark Kinkead, Killer Bee Software.